Status: Common but highly erratic regular winter visitor northwest, uncommon casual elsewhere. Documentation: Specimen: UNSM ZM12046, 7 Dec 1889 Lancaster Co.
Taxonomy: There are three subspecies recognized, garrulus of Eurasia, centralasiae of central and eastern Siberia, and pallidiceps of western Canada and northern and western USA (Pyle 1997, Witmer 2002). Nebraska birds are pallidiceps. Departure probably occurs by early Apr, although later reports are in May: 28 Apr 1990 Scotts Bluff Co, 1 May 1970 Scotts Bluff Co, 3 May 1962 Dawes Co, 8 May 1958 Scotts Bluff Co, and 14 on 12 May 2004 Wildcat Hills, Scotts Bluff Co. The earliest arrivals are in mid-Nov, although there are earlier reports 25 Sep 1976 Scotts Bluff Co, Sep 1980 Dawes Co (Williams 1981) and 10 Oct 1963 Lincoln Co. There is a specimen, UNSM ZM6738, collected 7 Nov.
Winter: This species appears in large numbers in some years and is absent in others; it is generally restricted to the northwest, although, while CBC data for 1959-1988 show high densities in the Panhandle, low densities extend rather far east over the western two-thirds of the state. Since 1988 numbers have been low on CBCs, except for a small spike in 2004-2005. Rosche (1982) listed incursion years and noted that in the 1970s and 1980s birds appeared in consecutive winters and were absent in the third, a pattern which repeated itself during that time period. It was considered a “common migratory visitor” in Logan Co (Glandon and Glandon 1934). 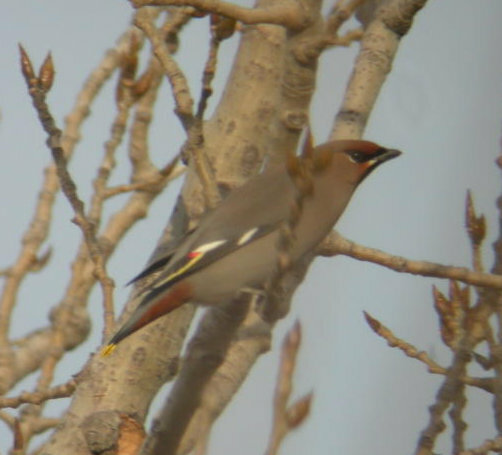 CBCs in the northwest regularly reported Bohemian Waxwings through 1979, with high counts of 570 at Scottsbluff in 1961 and 300 at Crawford, Dawes Co 23 Dec 1978. The only CBC report since 1979 was 10 birds at Lake McConaughy, Keith Co 28 Dec 1996, until the incursion of 2004-2005, when CBCs at Scottsbluff, Crawford, and Lake McConaughy had counts of 100, 235, and 237 respectively. A total of 325 was recorded on the Harrison CBC, Sioux Co 30 Dec 2007, and eight were easterly on the Lake McConaughy CBC 29 Dec 2007. Easternmost were one with Cedar Waxwings in Boyd Co 24 Feb 2013, and one in Buffalo Co 12 Mar 2011. One on the Omaha CBC, Douglas Co 30 Dec 1989 was in the Iowa part of the count circle. High counts: 419 at Monroe Canyon, Sioux Co 21 Nov 1998, 362 at Harrison 29 Dec 1996, and 300 at Chadron, Dawes Co Feb 1986 (Williams 1986). Tout (1947) stated that “hundreds, perhaps thousands” appeared in North Platte, Lincoln Co in Mar 1920.